The ECB apparently gave up on the race to cut its key rates and on the euro depreciation policy to focus instead on the transmission of monetary policy, especially on the credit to the private sector. We have estimated the amount of corporate bond purchases by the Eurosystem at between €3 bn and €4 bn per month and we think that this will be very hard for the Eurosystem to buy corporate bonds in exactly the same proportion as the credit indices. Making this assumption, our asset purchases’ projections indicate that the pressure will remain strong on European yields and sovereign spreads as long as the ECB gives no indication on when the PSPP. Besides, it is clear that the feasibility of the PSPP for the German sovereign segment will resurface at some point. Euro corporate market investors will be the real beneficiaries of recent central bank measures but one has to keep in mind that excessively low yields on the euro bond market could pose a real problem for investors in the medium term, and cause high volatility in case of stress, particularly on issuers not protected by the ECB programme. Interest rate cut: the refi rate and marginal lending rate were both lowered by 5 basis points to 0.00% and 0.25%, respectively. More importantly, another 10 bp was shaved off the deposit rate to -0.40%. 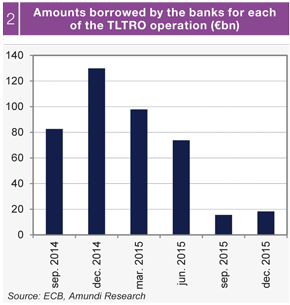 Monthly bond purchases raised from €60 bn to €80 bn. 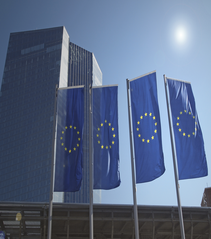 Extension of the QE to Investment Grade bonds issued by non-financial corporations. This programme will be called Corporate Sector Purchase Programme (CSPP). 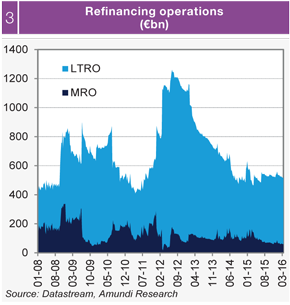 A new series of Targeted Longer-Term Refinancing Operations (TLTRO-2), each with a maturity of 4 years and a interest rate ranging from -0.40% to 0%. As a result, banks will be able to borrow up to 30% of the amount of their outstanding loans to non-financial corporations and households (excluding loans for house purchase) as at January 2016. These latest actions underscore the ECB’s undeniable determination to step up to the plate and hit hard. But just what conclusions should we draw from this, and above all what implications will these decisions have for the fixed-income markets? 1. Interest rate cut: the last act? The ECB has lowered its key rates once again. The markets were keenly focused on the deposit rate, which has been cut to -0.40%, but had been expected to be taken even lower. 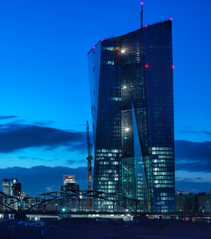 At the press conference, Mario Draghi clearly stressed that the ECB had no intention of reducing the deposit rate further (although this option has not been permanently set aside, as pointed out a few days later by ECB Chief Economist Peter Praet). It is important to understand that the ECB will conduct additional “unconventional” measures if need be. This is a sign of change of direction. It is no longer the ECB’s objective to bring the euro down from current levels. 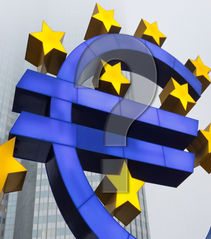 As we explained in detail in our Special Focus, “Is the ECB running out of leeway? Some thoughts before the March 10 Governing Council”, the introduction of negative rates decided in June 2014 paved the way for a steep decline in the euro effective exchange rate because it encouraged non-residents - and especially emerging countries’ central banks - to steer away from negative yield bonds, while driving European residents to seek yield outside the euro zone, mainly in the United States. To trigger another depreciation trend, the ECB would have had to cut the deposit rate much more, which would have dragged the German yield curve down hard. This would likely have proved counterproductive and nerve-racking, however (see Special Focus “Negative rates: a potentially counter‑productive and stress-inducing measure”, March 11). This is a sign of appeasement for banks, which had been worried about their profitability. The ECB appears to have changed course on March 10, apparently giving up on the race to cut its key rates and on the euro depreciation policy to focus instead on the transmission of monetary policy, especially on the credit to the private sector. The extension of QE-eligibility to corporate bonds will begin at the end of Q2 2016. The ECB will only purchase Investment Grade bonds issued by non-financial corporations established in the euro area. What are the main features of this market? The size of the market is approximately €665 bn, making up one-fourth of the Investment Grade universe. It has grown very little since 2012 due to the persistently limited funding requirements of European companies, unlike their US counterparts. We do not expect to see strong growth in this market over the next few quarters: investment spending will be curbed by the major uncertainty surrounding global growth. French issuers are by far the most active with 39% of outstanding issues, followed by Germany (24%), Italy (12%), Spain (9%) and Belgium (3%). The predominant sectors in this investment universe are Utilities (28% of market value), Auto (11%), Move (11%) and Energy (9%). Primary market volumes should end up in the neighbourhood of €120 bn this year. Method 1. 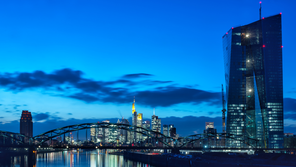 By our calculations, the ECB’s monthly purchases account for 0.6% of the total size of the market, either for the public sector purchase programme (PSPP) or for the third covered bond purchase programme (CBPP3). 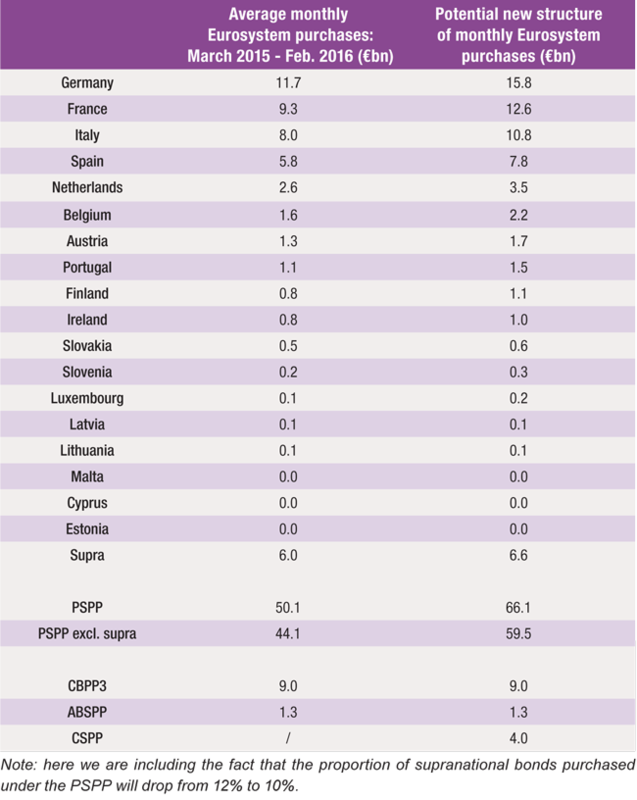 Using this same ratio for bonds issued by non-financial corporations domiciled in the euro area, the CSPP should account for around €4 bn in purchases each month. Method 2. Given the low liquidity on the secondary market for corporate bonds, the Eurosystem will take more of a position on the primary market. According to our estimates, (1) the companies concerned by the CSPP issue €120 bn per year and (2) the ECB might decide not to buy more than 33% of any given issue to avoid drying up the market. Based on these assumptions, we conclude that corporate bond purchases should top €3 bn per month. Another big question is which sectors/countries are favoured on the index? The majority of corporate bond purchases should be snapped up by national central banks (as with the PSPP and CBPP3) and the associated default risks shoud be shared (as with the CBPP3). 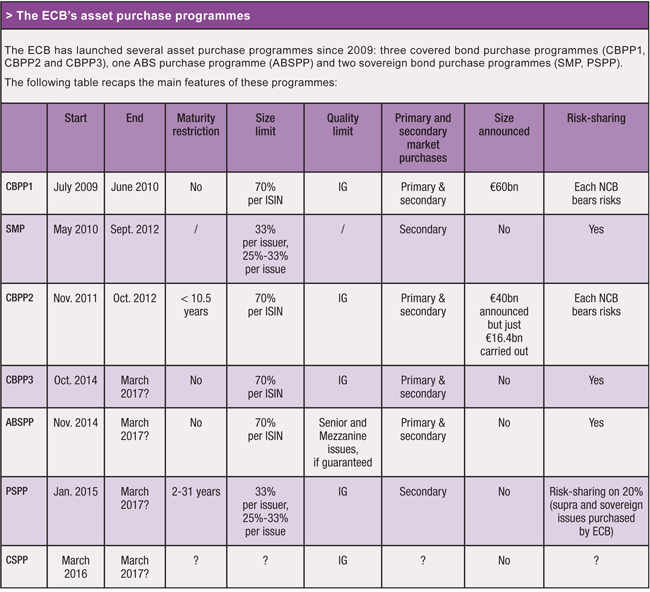 Having said that, as shown in Box n°1, the conditions of the different ECB bond buying programmes have varied widely, particularly when it comes to risk-sharing. Although the lion’s share of CBPP3 purchases has been made by national central banks (versus roughly 8% by the ECB), the associated default risks are shared. Meanwhile, the default risks on 20% of PSPP purchases are not shared: 80% of the risks are directly backed by national central banks. For the CSPP, which in principle will be two times smaller than the CBPP3, the risks will likely be shared between national central banks. In January 2015, Mario Draghi explained that 80% of PSPP risks were not shared primarily because of the massive size of the programme. 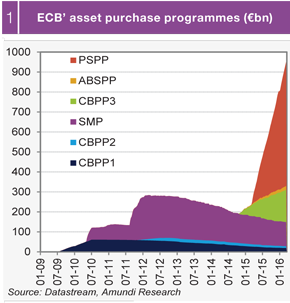 As was true of the PSPP, CBPP and SMP programmes, the amounts purchased by the national central banks under the CSPP will depend on each central bank’s portion of ECB capital. However, this gives absolutely no indication of the issuing countries of the corporate bonds that will be bought. 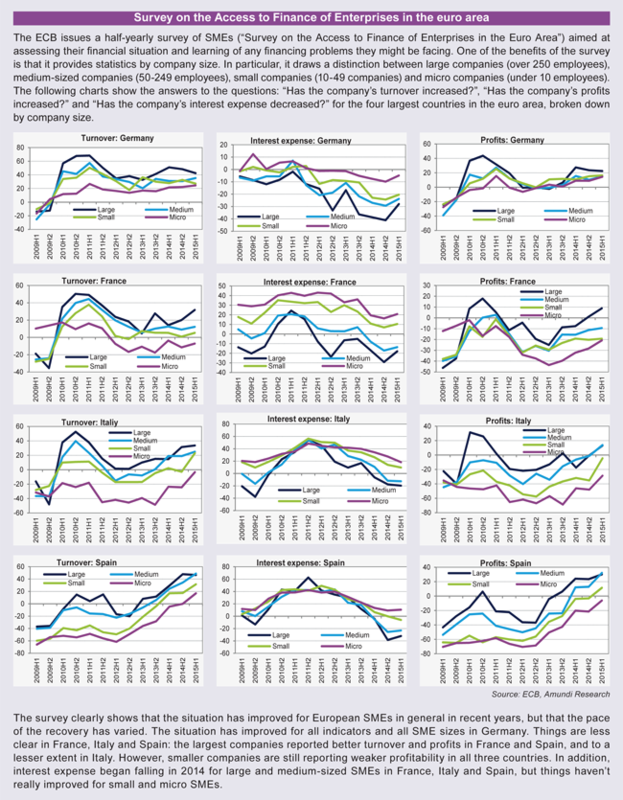 On March 18, Peter Praet stated that corporate bond purchases would be “close to the index” to avoid price distortions and prevent the breakdown of issuers by country from differing significantly with the contributions of the national central banks to the ECB’s capital (see charts opposite). That said, it seems idealistic to think that the national central banks will buy corporate bonds in exactly the same proportion as the credit indices. The ECB and the national central banks are saying extremely little on the matter, but the tidbits of information available in the annual reports of the Belgian and Dutch central banks tend to indicate that the central banks have overweighted bonds issued by corporations domiciled in their own countries under the CBPP programmes, more or less in line with the market indices for other countries. Consequently, the corporate bonds getting the short end of the stick in this scheme (compared to those of other countries) are French bonds, which comprise over 39% of the index while France contributes just 20% to the ECB’s capital. 3. What will the PSPP programme look like once CSPP starts? Under these conditions, monthly purchases of German sovereigns should end up at around €16 bn, i.e. approximately €190 bn per year, while the net issuance of German central government debt in 2016 will be zero, or virtually zero. According to our estimates, the constraints weighing on the PSPP (maturity ranging from 2 to 31 years, yield to maturity higher than the deposit rate, 33% share limit on each issue and each issuer) will make the PSPP impossible for Germany by around mid-2017. And while these estimates are highly approximate given their sensitivity to changes in the yield curve, it is clear that the feasibility of the PSPP for the German sovereign segment will become problematic, and that pressure will remain strong on European yields and sovereign spreads as long as the ECB gives no indication on when the PSPP will come to an end (not unlike Ben Bernanke’s statements on the tapering of the Fed’s QE3 in May 2013). Extending the ECB’s QE past its theoretical end date (March 2017) would definitely raise questions as to the nature of the bonds being purchased. 4. 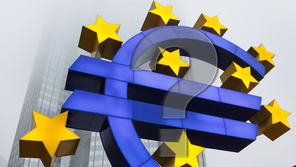 Will these measures really stimulate credit in the euro area? Spreads widened, preventing the Euro IG yield from falling below the (historically low) 1.20% threshold. The primary market High Yield segment saw little activity. Investors were also hesitant to take positions at the long end of the Investment Grade curve due to insufficient yield. We are sceptical about the impact this measure will have on economic growth. IG issuers enjoy exceptional financing conditions as it is, with interest rates already at record lows. On the downside, this measure will very likely exacerbate the difference in terms of access to funding between companies targeted by the CSPP and those that are not. Peter Praet’s answer to this problem is that fair access to financing will be made possible by portfolio reallocations and investor appetite, as investors (desperately) search for yield. This reasoning is valid to a certain extent. lending to SMEs (but also households for the consumer finance segment) is the main reason the ECB decided to launch a new series of Targeted Longer-Term Refinancing Operations (TLTRO2) on March 10, with a maturity of four years and an interest rate ranging from -0.40% and 0%, depending on the volume of loans actually granted to the private sector. main (or the only) issue for banks. 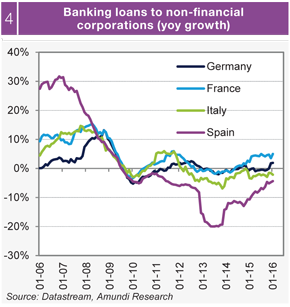 Two issues prevent bank businesses volume of loans from increasing: lack of bank capital (especially in the Eurozone periphery) and lack of demand for lending for investment (especially in the core euro area). 5. Euro corporate market investors will be the real beneficiaries of recent central bank measures. The surplus demand generated by the CSPP will substantially boost current spread levels of non-financial issuers domicile in the Eurozone, and these corporate bonds should end up outperforming their sovereign counterparts. This measure aims also to encourage investors to reallocate their portfolios towards risky assets, which should also be supportive for the large majority of HY and financial issuers. In the medium term, excessively low yields on the euro bond market could pose a real problem for investors and cause high volatility in case of stress, particularly on issuers not protected by the ECB programme. In the medium term, excessively low yields on the euro bond market could pose a real problem for investors and cause high volatility in case of stress, particularly on issuers not protected by the ECB programme. This measure aims to encourage investors to reallocate their portfolios towards risky assets. But is that really such a good idea in the medium term? Investors may base their asset allocation policy more on potential monetary policy initiatives rather than on the fundamental value of these assets. As a result, they may not be inclined to seriously analyse the financial situations of the issuers. In their search for yield, investors will turn more and more to corporate debt established outside the euro area. A growing number of non European corporate issuers, and especially US issuers, are looking to the euro market for financing. Remember that US corporate leverage have reached over the last quarters record high levels. Investor appetite could limit the motivation of investors to maintain good solvency. And, without growth prospects, many companies could issue bonds to buy back their own shares and to finance M&A operations rather than invest. Conclusion: monetary policy has its merits but isn't enought! Monetary policy has its merits. Mario Draghi has rightly stated that without the ECB’s QE, the euro area would have fallen into deflation. True also, unconventional monetary policy measures are responsible for the financial defragmentation observed for 18 months. But monetary policy cannot do everything. It is becoming increasingly clear that without fiscal leverage, the ECB’s battle is a lost cause. It is fighting a reality that is increasingly slipping out of its grasp. Without applying a strong public investment policy, QE leads to poor allocation of resources and has little impact on inflation, making the ECB’s efforts in vain. That said, the future impact of these measures on GDP growth should not be overestimated. It’s one thing to maintain financial conditions that are conducive to domestic growth - which the ECB has just done - and another thing entirely to see growth accelerate in an environment that holds lacklustre growth prospects for the foreseeable future, in our view. Since mid-2014, the ECB has taken unconventional monetary policy measures on an unprecedented scale. It has introduced a negative interest rate on excess reserves held by banks (reduced twice, down to -0.30%).